Let us get to know author Sunanda Chatterjee today. She’s on my blog, answering questions about her writing and her book, Sins of the Father. I have been writing stories from a young age. In fact, I recently discovered a story I had begun to write in my diary as a fifth-grader and had a great laugh about it with my daughter. I wanted to write and paint. That’s all. But growing up in a small town based on the Steel Plant, everyone in my neighbourhood was an engineer or a doctor and the social and family pressure to conform was immense. So I became a doctor, joined the Indian Air Force for five years, then did my PhD (6 years) and my Pathology residency (four years). I was always busy with academics and work, and only when I started working as a pathologist did I decide it was time to take the plunge, so to speak. My first novel took me ten years from start to publication, with many hurdles along the way. Since then I’ve published 3-4 books a year and hope to keep going despite my full-time job. Which is your favourite genre to read? My favourite genres to read are women’s fiction and thrillers. Romance is not my favourite genre to read, but I do read a lot so I know the tropes. I think switching up genres as well as indie and traditionally published books keep me interested at all times. When I’m not in a mood to read my usual genres, I read short stories or non-fiction. I recently read a book called ‘Economics for Dummies’ and enjoyed it a lot. Sometimes I pick up a book my daughter’s High School English class is studying. I also read a lot about writing itself. My nightstand is full of books about creative writing. When I’m tired of it all, I re-read Harry Potters. Yes, I’m a Potter fan through and through. Do you believe authors should read extensively? Why? I am biased on this topic because I believe everyone should read extensively. Simply put, whether you’re reading fiction or non-fiction, it opens your mind. This applies to authors in particular. There are so many benefits that I cannot begin to list them. You learn new vocabulary, syntax, grammar, literary devices, tropes, effective use of voice, points of view, locales, local lingo and traditions and cultures. In fact, not only should authors read in their own genre, they should read in other related or unrelated genres to constantly expand their boundaries. That’s how niche and subgenres take root. Tell us something about your book? Any forthcoming book releases? Wellington Estates is my first series. I expect there to be five books in the series, each being a stand-alone saga. All the stories are based on characters with connections to an exclusive community in the foothills of San Gabriel mountains in Southern California. They are privileged and wealthy, and of course, they fall in love with people who are deemed unacceptable in their social circles, for money, race or profession. Each family has secrets, vices, and pasts that prevent the members from leading fulfilling lives. These stories are not straight-out romance, although the romantic element is strong in each novel and it drives the story. But other characters also get the spotlight and parts of the stories are told from the parents’ or friends’ point of view. I like to call this genre as romantic saga, bridging romance and women’s fiction. Book 1, Sins of the Father deals with Harrison, a cop, who is the ex-heir of a Wellington Estate. He falls in love with Laura, a budding therapist and the daughter of a thief. Unacceptable all around. Laura’s friendship with Juhi is highlighted in this book. Book 2, Old Money deals with Connor, who shuns his Wellington Estates wealth to become a photographer. He falls in love with fashion designer Juhi who comes from a middle-class family with ties to his own and with secrets that prevent them from being together. Connor’s sister Danielle is introduced here. My upcoming release is book 3, The Trouble with Love. This is the story of Danielle who has grown up without want and falls in love with a poor athlete. But instead of her family rejecting him, it turns out that he rejects her for lack of purpose and direction. Danielle travels to India to find purpose. Danielle’s friend Lily is introduced in this book. I am writing Book 4, The Wish to Belong, will highlight Lily’s story with Arjun, the heir to a vineyard estate. Next will be Book 5 (as yet unnamed) will be about Arjun’s sister, who is married to an Indian Air Force Officer but circumstances lead her to Wellington Estates where she finds love again. Thank you, Sunanda. It was great having you here and getting to know about all your books. Wish you success with Sins of the Father and more. Author Sudesna Ghosh has her book My Singapore Fling released recently. She’s on blog tour for her book. Let us get to know her through this question and answer session. 1) What made you choose Singapore for your book’s setting? Singapore is my favourite travel destination near my home city of Kolkata. I love the cosmopolitan environment just a four hour flight away! And with Dipa on the search for foreign accents, it’s a great choice I think. 2) What inspires you to write romance? I started my writing career with nonfiction and then realised that I love writing stories for children. Then suddenly, I found myself making friends with several romance authors. Conversations with these friends motivated me to try my hand at the romance genre. Plus, I love reading romance novels. My Singapore Fling has been receiving great reviews and I’ve even written a Christmas romance after that! 3) Name your favourite romance author? Sarah Morgan is my favourite romance author. I fall in love with her heroes. Writing for children suits me well. I am an overgrown child who refuses to grow up, so creating cute stories is fun for me. 5) What’s next in your writing repertoire? I’ve released 5 ebooks this year on Amazon Kindle. I am taking a break now. But the next will be another romance – set in my city of Kolkata. Please welcome author Amit Sharma on my blog. 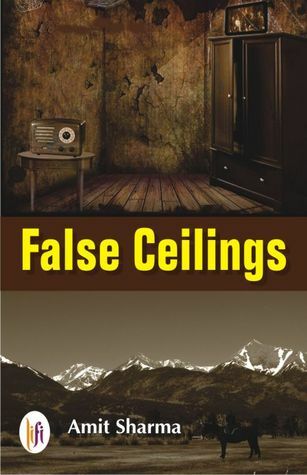 His book False Ceilings is out now. 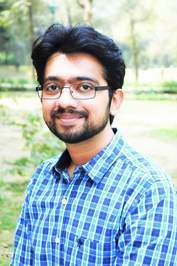 Let us get to know more about Amit and his work through a question and answer session. It was a conscious decision. I have been blogging for a few years and the success of my blog made me wonder if I should try writing a full-length novel. I wasn’t very confident but loved the process when I picked up the project. The reviews by friends were encouraging and that is when I realized that it might just be possible to get published. I am not. While I was writing it, I had no idea what the genre of my first book was. I didn’t want to promote it as a Family saga because you won’t realize it’s about a family till you are halfway through. Till now, I have no idea what the genre of my second book is. But I guess, it’s important to categorize your book to sell it. That is how the world works. The fact that I was able to finish it and get it published makes it special. I know I will not feel this way with my second or third book. It’s a special feeling that only your first book can provide. Secondly, the story is very close to my heart. It’s based on true events and a lot of my own angst and frustrations went into creating the characters and how they feel about the world in general. There is a lot of me in the characters. The story begins with Shakuntala, who is born in the lush mountains of Dalhousie in 1930 to a wealthy builder. As India inches towards her independence, Shakuntala’s world starts crumbling. It is an enormous owl sitting on Shakuntala’s bed that brings evil news and changes her life. On her wedding night in 1946, she is gifted a secret to use wisely when the time comes. The story moves non-linearly from the green valleys of Dalhousie to a village in Punjab reeling under the communal violence of 1947; from the Delhi of 1950s with its intoxicating smell of freedom to the Delhi of 1970s soaked in the hippie culture; from the Delhi of 1984 smelling of burnt tyres to the Delhi of 1990s raising the Frankenstein of urbanization. The six protagonists – Shakuntala, Aaryan, Manohar, Vinod, Meena and Lipi – are bound by the cancerous secret for 130 years. It is accidentally passed down, hidden under insecurities and jealousies, locked in its meaninglessness and leaving a trail of ruin. The story is based on true events. The relationships between the protagonists are real. A few events are fictional and the story is much more about the revelation of the secret in the end. For me it was about getting under the skin of this dysfunctional family, to present them as I saw them in real life, to make their actions and thoughts believable and human. I can’t write in picturesque places. I can either stare at nature or write. I don’t know how writers do both. I need a closed room when I write. Plotter definitely. I need the storyline including the beginning and end, the chapter outline and my research work completed before I can even think of writing the first page of my book. Traditional. I am not comfortable with the idea of self-publishing but I am not completely averse to it. Sloppy. First draft can never be a polished one for me. I have to go through multiple iterations for it to look acceptable. No Deadlines for me. I can’t work with deadlines while writing. They are only a part of my day job. Writing a certain target every day or in floods and droughts? Floods and Droughts. I usually write over weekend as I am too busy throughout the weekdays. Again, setting a target puts me off writing. Here’s more about the book. This post is a part of the blog tour hosted by The Book Club. Today I have Ruchi Singh on my blog, chatting about her book Take 2 and all things writing. Please welcome her. RS: Thank you Summerita for this wonderful opportunity to talk to you. RS: A bit of both in my case. It started by chance, like an epiphany that yes I can and should write. After the first draft of Take 2, it was my choice to continue writing since I immensely enjoyed the process of creating something new. RS: Yes, I think I am a genre writer. I love reading romantic thrillers and the creative thoughts flooding my mind also resonate with the same genre. RS: This book is very special for two reasons. Firstly, because it is my debut book, and secondly, because it captures the emotional vulnerability of women in our society. I have observed it up-close, women just can’t let it go. No matter how many times an abuser apologises, there is no change in the status quo. It’s like a leopard never changing its spot. The victim has to take that first step to break-free, then only they would find the strength to move ahead in life. Though it’s a grave issue but I have tried to handle it in a light-hearted manner in the book. RS: There are two main themes which I wanted to highlight in Take 2, firstly the plight of women who were divorced or thinking of divorce, and secondly the co-existence of conservative and modern India. Abhimanyu’s character was conceived to compliment Priya. He is far more mature than his age. If you are in love with someone you have to nurture it by showing support, care and affection. And that is what Abhimanyu does for Priya. I have tried to bring out that sentiment in the story along with some drama to entertain the readers. And since I am an eternally optimistic person and all my stories would have HEA. I also admit to bringing a bit of Bollywood to make it a light read. RS: I can’t move ahead until all the colourful wriggly lines (the MS editor throws) are resolved in the paragraph/ line that I have written. My friends tell me to switch off the editor, but my conscious doesn’t allow me to. Thanks, Ruchi. Emotional and physical abuse in any relationship is a grave issue and needs to be brought into open. I am glad you have chosen to write about it in a relatable and light manner. It was lovely having you here. This interview is a part of the Book Club Tour for Ruchi’s book. Here are the details. Do check it out. Ruchi Singh is a novelist, and writes in two genres; romance and romantic thriller. She has a degree in Electronics Engineering and has worked as Quality Consultant in the IT field. She began her writing career writing short stories and articles, which have been published on various online forums. She has been a contributing author to many anthologies and has published her first book Take 2, which is a contemporary romance with a spice of social drama.A voracious reader, she loves everything—from classics to memoirs to editorials to chick-lit, but her favourite genre is ‘romantic thriller’. Besides writing and reading, her other interests include dabbling with Indian classical dance forms.